At the opening event for “Forms of Imagination: Reveal and Action” at the Arts Incubator, patrons didn’t stay inside for very long. Instead, they filled the sidewalk in front of the Incubator, gathering around a reshaped and decorated street cart filled with goods. 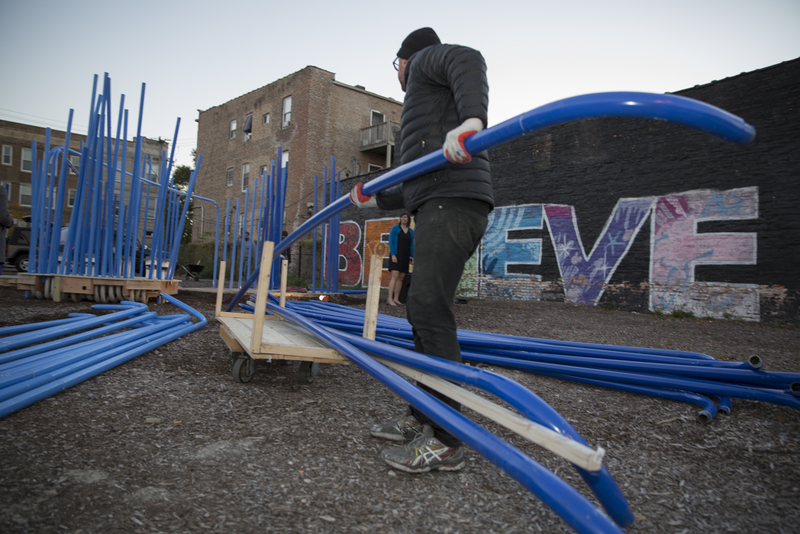 In a vacant lot across Prairie Avenue, under the eye-catching “BELIEVE” mural, a structure of blue PVC pipes, reminiscent of a playground, took form before the eyes of the amused crowd. The revamped street cart, called “Nomadic Habitat,” is a vendor cart redesigned by artist Carlos Rolón/Dzine and put to use by local street seller Garland Gantt. The blue pipes constituted the “Resonance Room,” a percussion installation created by PORT Urbanism in partnership with musician Mikel Patrick Avery. Its “activation” was the night’s big event: as soon as the structure was ready, the audience was invited to enter it and watch South Side-based percussion group Bucket Boys give life to the pipe drums. This was the first event in a three-part series entitled “Forms of Imagination,” the Arts Incubator’s contribution to the Chicago Architecture Biennial. Co-curated by art historian and artist Tempestt Hazel, the Incubator’s arts program manager, and architect and urban designer Paola Aguirre, the Incubator’s research analyst, “Forms of Imagination” is a full exploration of the Incubator’s potentialities, responding to multiple aspects of the questions central to both the Biennial and the Arts Incubator. About a week after its opening, on October 22, the “ Resonation Room” was still standing strong, but the rickshaw had been rolled inside and the Incubator’s doors were closed. Visitors were directed to the intersection of King Drive and Garfield Boulevard. There, an old auto shop had been turned into a temporary outdoor cinema, with a projector on the sidewalk directed at the shop’s wall, a semicircle of foldable chairs, and a table with hot chocolate, marshmallows, and graham crackers for the chilly night. The night’s event, “South Side Home Movies,” was a screening and discussion of recordings from the archives of University of Chicago professor Jacqueline Stewart, who researches homemade films from the time of 8mm, Super 8mm, and 16mm cameras. Judging by the first two events, they have succeeded at sparking curiosity in students, architects, curious neighbors, and passers-by alike. (The final event in “Forms of Expression” will be excerpts from Barak adé Soleil’s performance “Triptych: Cycle” on November 12). Visitors’ engagement with the space before, during and after the presentation was remarkable during both: they gathered in groups to discuss the event and approached the artists, and children ran and played nearby, creating an instantaneous feeling of community. Aguirre and Hazel explain that they explored themes related to time and space with the three events that comprise “Forms of Imagination.” The series experiments with different timescales, from the permanence of the “Resonance Room” installation to the mobility of the rickshaw in “Nomadic Habitat,” which might eventually travel to other places, to the ephemeral “South Side Home Movies,” which left no physical trace after its realization. Similarly, each works with a different range of sizes, from the movie screening on the dimensions of a building, to the “Resonance Room” on the scale of the vacant lot, to the small rickshaw, a mobile object. The rickshaw was a partnership too, between Pilsen-based artist Carlos Rolón and Garland Gantt, better known as “Hustleman,” a street vendor who sells everything from snacks to bed sheets next to the Green Line station across the street from the Incubator. 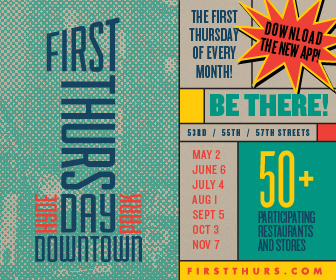 In placing Gantt’s work into the domain of the arts, the Arts Incubator harkens to its very foundation of thinking about neighborhoods, their economic development, and their relationship to arts and culture. Rolón, who introduces Gantt as his artistic partner, sees in the project a way of changing the way people view the street seller, and hopes the cart will travel to other communities. Correction: An earlier version of this piece referred to “Nomadic Habitat” as a rickshaw; it is a vendor cart. It also incorrectly labelled the installation “Resonation Room” as the “Resonance Room”.